Left : See the closet-bowl booth of the ladies' toilet room. The room has an opening on the ceiling and light pours and air passes. The booth is quite large, so, even if they sit on the closet bowl seat, there is mostly no case that they get wet with rain. It is seldom has the influence from an opening in the case of rain. The rise part of the ceiling opening is finished with fiber reinforced plastic waterproofing and the wall is finished with paint with external specification so that those would be no problem to rain. Moreover, a drain hole is under a gravel to collect the rain that falls inside. Right : See the opening of the closet-bowl booth of the ladies' toilet room. 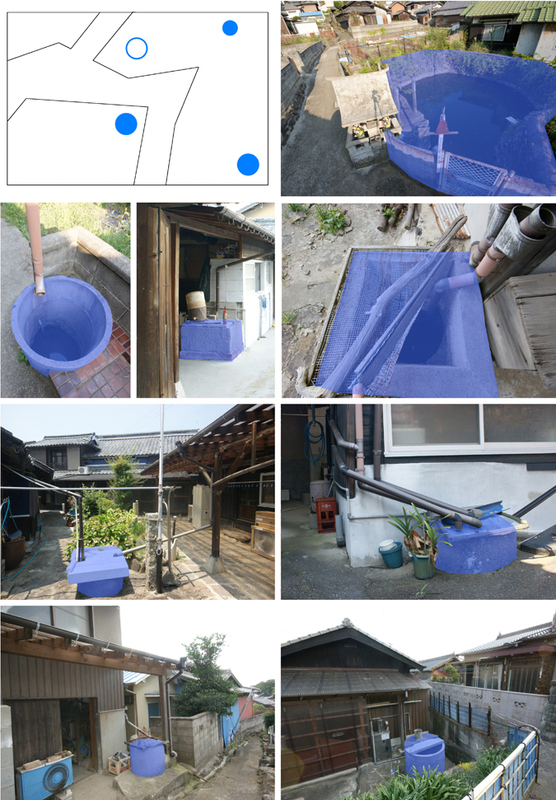 Bottom : The examples of the well for collecting the rain water in Ibukijima Island which is not abundant in water.